I use right Ctrl for e.g. Ctrl + A, C, and V. That is, its use is the same as right Shift. Me, most commonly when I have Chinese-enabled keyboard in front of me, usually not my own, and I am too lazy to check which of a dozen different Chinese composition input method is used to disable them and make sure they stay disabled. None of these method, to my knowledge, compose UPPERCASE, so typing an URL for instance is much less annoying. This, I suspect, will increase the use of upper-case Latin letters in mixed western/Chinese messages, as it is a whole lot faster/convenient. I'd imagine a Western QWERTY keyboard would map reasonably well to related alphabets like Cyrillic, Greek, Hebrew, and Arabic. However, for a language like Chinese it must be horrible. Then again, I hear young Chinese people primarily use Pinyin for Chinese-character input. Compared to you, I am left-handed. I don't use right Shift either, ever. I wouldn't call Cyrillic, Greek, Hebrew and Arabic related. The only thing that is related to Latin is that they are all alphabets. To non-natives it's always hard to switch between them. It requires training. I am amazed how well-trained Greeks and Russians often are when they switch to a Latin-based layout and begin typing. Chinese is another matter. It's not an alphabet. What I have heard is that they type letters based on pinyin and at the same time on the screen the selection of the actually needed mark narrows down. I don't know if there could be any other ways to make Chinese work on keyboards. The majority of composing methods use Pinyin, there are also some that are more related to the characters themselves, and a few other method. It is easy to fit, uses an ASCII (unless diacritical marks are included), and younger Chinese learn Pinyin at school anyway. With Pinyin QWERTZ and AZERTY would be horrible, as the Pinzin transcription uses Y, Z, W, Q, and A a lot, while these are relatively rare letters in English. A huge advantage with Pinyin is that it allows alphabetical sorting, which is a lot more convenient, to me anyways, than the alternatives. You sort by Pinyin, then by diacritics (tone marks), and then handle any remaining ambiguity by some other algorithm. I was talking about the potential serviceability of the same physical structure, not any particular key mappings -- although one might imagine the numbers would be in the same place. I call these alphabets related for the simple fact that they are: all these alphabets come from the same Phoenician source. Some characters can be traced back even further to Egyptian hieroglyphics and the Sinai desert. Speaking of hieroglyphs, for their customisation, they are still quite typewriter-ish in nature. They don't fully take advantage of the switch to Unicode. It should be possible to combine phoney keyboard intelligence and Chinese composing techniques to compose the right Unicode characters at need. Mine is practically the same (without the right number section) - except that I have a "print" button betwixt the right "Alt" and "Ctrl". You're lucky to have 2 Enters, huh? The 14th century called. They want their word back. I found that in RJ's lexicon!.. It's still used in Scottish English, true. Same as mine - except for the "print" button. Where is it? Is it? You mean Print Screen? There's no dedicated button for this. There's Insert next to Delete (top right corner). Print Screen is the other function of Insert. Next to left Ctrl is the Fn button that changes the function. No, I meant the printer 'print' button. Sorry, I couldn't see your "F" row clearly. So far it hasn't been needed anyway. I didn't even know there was a printer print button in computers. In my early years with computers, I thought PrintScr would send screen capture to the printer, if the printer were connected. Otherwise it didn't seem to do anything in Windows. I only discovered later you have to open up an image editor and paste there to see what the PrintScr key had done, that it actually had a function. But Linux desktops make it flashily clear what PrintScr does. Cool. Install e.g. Greenshot in Windows. Tell me better about screenshot apps in Android. What do you have? I believe pressing power and volume down together takes a screenshot on most devices. In my case, it's simply an entry on the reboot/shutdown menu. No apps. On most devices? Why didn't it ever work on any of my devices? Also not on the current one: LG-P500 Android 2.3.3. Sorry, most devices with Android 4.0 or higher. A quick search suggests power + home should work on yours. 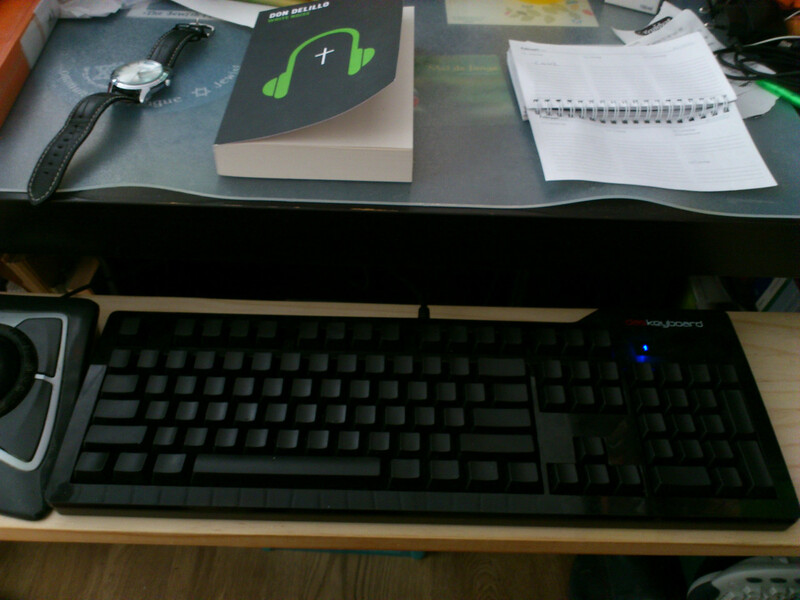 I admit I could probably get a lot more use out of my function keys by remapping them. The only change I've made to the default US International layout is using "Caps Lock" as "Compose".